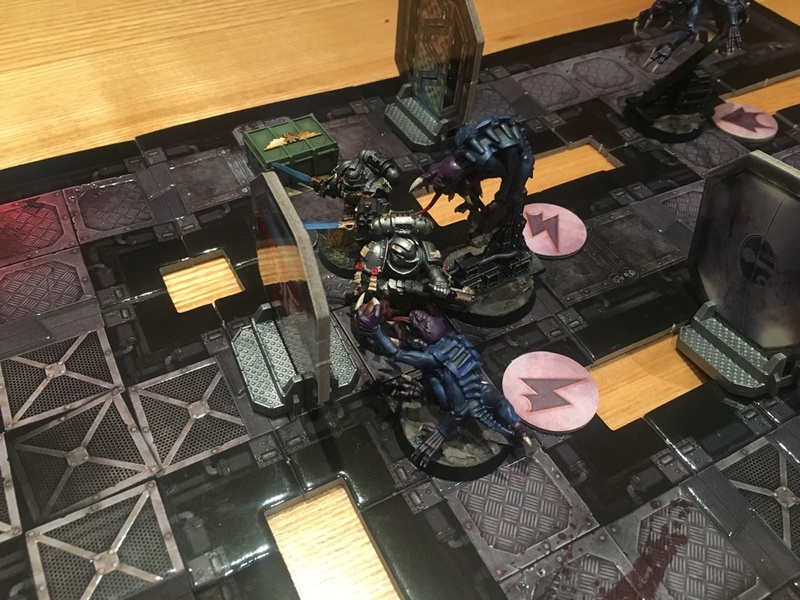 A couple of weeks ago Dan and I played two games of Kill Team, but rather than using the standard board and terrain, we decided to use the Space Hulk tiles. For this game we adopted the Kill Team: Rogue Trader close fighting rules, with two simple amendments: i) friendly models can move through each other if they have sufficient movement to do so and ii) models cannot draw LoS through other models in single width corridors. These simple rules resulted in two tense and exciting games. It meant my Genestealers could often charge from behind cover, with Dan only able to use the ‘Point-blank Overwatch’ tactic once per turn. This would seem to advantage the Genestealers, but as they weren’t able to concentrate multiple chargers on a single model (because of the narrow corridors) it evened out. If you fancy a claustrophobic and tense game I recommend giving it a go! ← Bulldog, Bulldog… 1, 2, 3!